Rom. 8:34 NIV – Christ Jesus who died—more than that, who was raised to life—is at the right hand of God and is also interceding for us. Heb.9:24 AMP – He has entered into Heaven itself, now to appear in the very presence of God on our behalf. Wow! When we face the hardest tests of our lives it’s beyond encouraging to know that Jesus Himself is praying for us! That’s enough right there to give us all the courage and faith necessary to make it. He also intercedes for us when we have sinned … “If any man sin, we have an Advocate [an Intercessor] with the Father, Jesus Christ the righteous.” (I John 2:1) He knows how God’s judicial system works. He understands the justice of the Father. He is the Righteous Judge. ( 2 Tim.4:8) When He intercedes for us to the Father He is not saying, “Oh Father, please have mercy on them. You know how weak and foolish they are.” No. It’s a courtroom scene where the high courts of Heaven are set up. God’s legal system says that without the shedding of blood there is no remission of sins. (Heb.9:22) Jesus, God’s son, is the One who shed His own blood for us. He stands there as an ever present reminder of that fact. How can we lose! God has set things up in our favor over and over again. When we come up against things we cannot overcome, Christ Himself is interceding for us to the Father. And if we allow Him to, He also lives His life through us doing things that we can only do “in Him”. I can do all things through Christ who strengthens me. We are more than conquerors when we are in Him. Having a bad day? Check out this passage of scripture and read it in several translations until it really hits you and becomes a part of you. For a visual on this, see the photo attached to the previous blog post. Have a wonderful day! The hot wind coming from the Indian Ocean blew sand across the tent of meeting, stinging our faces. But along with the clouds of sand, there were spiritual clouds of glory that day as worshippers from around the world exalted Jesus as King. As the Holy Spirit began to give prophetic insight into how to pray for several different countries, the presence of God became thick and people began to intercede for their nations. In the midst of this, my husband looked toward the makeshift platform and saw Jesus standing high above the tent. His form stretched up into the sky and He was clothed in priestly garments. The light coming from Him was so bright that little could be seen of His face. 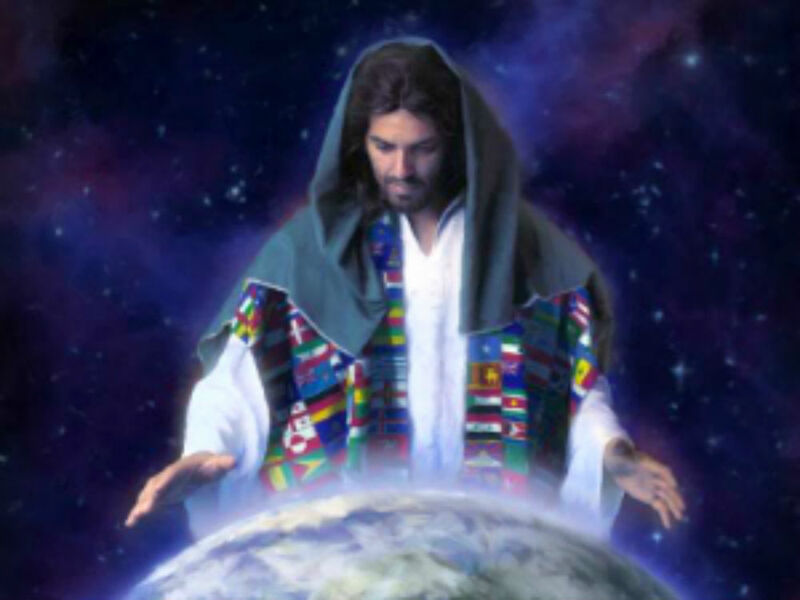 Small orbs of light were spinning around Him, now touching, now lifting off of His glory. As intercession was made, the orbs of light were sent speeding out to the earth to all the countries and people who were being prayed for. Help and hope were on the way. I settled into my chair in our small group meeting and entered into the worship that was swirling around me. It was like catching a ride on a passing train with all the others. Gradually I became aware of a night sky and the feeling of flight. In the Spirit now, I seemed to be on a plane, leaning my head against a cold window pane. But suddenly I was aware of a cold wind as well. Now I realized that I was flying – but I was outside the plane looking in! This had a different feel somehow than other prophetic experiences. There was more of a present reality sort of feeling, as though I was witnessing a particular place or set of circumstances here on earth. This was not a high-level, out of body experience but rather a prophetic impression which I had to fight to hold onto and keep believing and moving with it. The plane was a large jet and this flight was very full. I saw the word United on the side and thought it might be a United Airlines fight. But a second look told me it was United Arab Emirates and most of the people on board were Middle Eastern. Being somewhat new to this particular type of prophetic experience, I was unsure where I was or why I was there. But I felt I was there to pray and sensed that the plane was in some sort of danger. I prayed for safety and protection and that angels would be sent to help. Then I looked into the plane and saw many beautiful Arab children with their olive skin, black hair and big brown eyes. There were families on board with many children and babies and some pregnant women. I began to pray for them, not only for their safety but that God would reveal Himself to them, seal their future destinies for His Kingdom and bring them out of darkness. In the end I did sense a peace that the danger to the flight was past and everything would be alright. When you make yourself available to the Lord for prophetic intercession, He can take you anywhere to pray for anyone. (See the other postings under Intercession for some exciting testimonies.) Though this was low on the scale of prophetic experiences, I mention it to show different ways He can speak to us. Some are such slight impressions that we can easily miss them or mistake them for our own thoughts at first. But if we keep pushing aside the distractions, focus on what we are seeing and keep asking for more … anything is possible with God. Years ago in the 90s during the days of renewal, we were privileged to be near enough to Toronto Airport Christian Fellowship to be there often. I spent so much time resting in the Spirit on that carpet I feel as though I have permanent rug burn on my heart. It changed me forever and I am deeply grateful to the Lord. I remember attending an intercessory prayer meeting there that absolutely blew me away. They met in a theatre type room that seated about 100 people and it was overflowing. After inviting the Holy Spirit, the leader laid out the plan for us and gave us time limits due to the size of the crowd. We would spend 10 minutes in quiet listening prayer to see what was on God’s heart. What did He have to say and what did He want us to pray about? We were each to write down what He showed us. Then the leader began to call for people to come forward individually to share what God had told them and pray into that. By this time there was such a thick presence of God in the room that some people were sobbing and others were shaking so hard they could not even hold the microphone. Often someone else had to read their notes for them since they had crumpled to the floor. By the way, these were Catholics, Baptists, Charismatics – people from various denominations, cultures and nations learning how to be truly one in the Spirit. It was stunning. Imagine the possibilities of that kind of prayer. Could this be the end of the boring prayer meeting? You know, the kind where it’s all about me and my little group, none of the prayers make it past the city limits and everyone is trying hard to stay awake. Even the angels are yawning at meetings like that because they don’t have much to do! Psalm 103:20 says that they “excel in strength and do His commandments, harkening to (listening with the intent to obey) the voice of His word.” While we do not command them or tell them what to do, they are also listening for the voice of His Word to come through our mouths! When we pray according to His Word and His will, the angels are sent to ‘do His commandments’ and bring answers to those prayers. Let’s pray the Word of God and make declarations in agreement with His Word. Let’s ask Him how He feels about things and then pray His heart and His will into the matter. His prayers get answered! For more on this type of prayer see http://www.maheshchavda.com and their weekly Watch of the Lord. I also recommend James Goll’s website, Encounters Network and Prayer Storm http://www.encountersnetwork.org. This entire company of people is relying upon us to become everything God called us to be so that they are made perfect. That is a huge responsibility! We have been studying the great cloud of witnesses spoken about in Hebrews chapters 11 and 12. (See the previous 2 postings for more on this subject.) This group is composed of all the over-comers who died in the faith from Adam to the present time. They fought and ran the race but did not receive the promises. They only saw and embraced them from afar. (Heb.11:13) The last 2 verses of chapter 11 always puzzled me. It says they “received not the promise: God having provided some better thing for us, that they without us should not be made perfect (complete).” While I don’t pretend to fully understand this, recent prophetic experiences along with study and revelation have begun to shine some light on it. Let’s look at some other scripture passages referring to this group. Dan. 7:21,22 says that the horn of the adversary will wage war with the saints and overcome them … until … the Ancient of Days comes and renders a verdict in favor of the saints and they take possession of the Kingdom. For thousands of years our enemy has been waging war against us. Millions of our brothers and sisters in Christ have been martyred along with all their gifts and callings. All that they would have done for the rest of their earthly lives was stolen from them and those acts of injustice by the enemy were recorded in the God’s books. This is the eternal perspective of the cloud of witnesses. The enemy will be judged and they will be rewarded. But how do you and I fit into that picture now? How do we help to make them perfect or complete? What God is in the process of doing in these days is amazing! We are going to be the beneficiaries of things we haven’t even sown, of centuries of prayers of martyred saints and those who didn’t see the fulfillment. God is pouring out all the gifts and anointings and commissionings that have ever been stolen from the Body of Christ back into this generation! Jesus said in John 4, those who sow and those who reap rejoice together. Millions of our brothers were sown like a seed and now that’s coming to harvest and we will reap the very things that the enemy stole from them. Of course we also have our own callings to fulfill, not just to finish what someone else began. But the point is that it’s pay-back time now and God is freely giving us all that we need to finish this great task. Ask and you shall receive! He can take the anointings of the great men and women of old and multiply them and then pour them out on a body of people so that when they achieve the fullness of that mandate the cloud of witnesses will share in the fruit of it. Remember that they surround us and have a vested interest in what we do. (Heb. 12:1) May we run this race and finish well, accomplishing all He put us here to do … for them, for our children and grand-children, but most of all for Him.